At Home Comfort Plumbing and Heating we pride ourselves on an efficient and friendly service, and strive to achieve 100% customer satisfaction. We have the knowledge and experience to provide a comprehensive plumbing service. We have high standards and offer excellent value for money on every job we undertake, always maintaining a high standard of customer satisfaction, giving you complete peace of mind at all times. If you are looking for a plumber in Watford, then Home Comfort Plumbing and Heating are here to help! Whether you would like a free quotation or just need a reliable company to carry out an installation, to upgrade your boiler, or to fix a leak, please contact us for more details. Most of our work comes through existing customers and recommendations. Each of our engineers are Gas Safe registered meaning that they work to and practice to the highest quality standards. You can learn more about our Gas Safe registeration here. Andrew has over 30 years' of engineering experience and is an expert in all areas of his trade. He regularly attends training courses to keep totally up to date with both old and new technology. Andrew’s main area of expertise is fault finding, repairs and installations of boilers he works on all makes and models and highly recommends Viessmann. 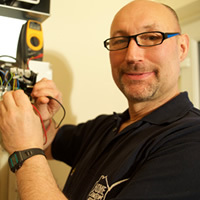 Andrew is highly regarded in his trade and teaches other engineers in technical heating designs. Andrew is also a member of Ecotechnicians which is a national company consisting of the most highly skilled and knowledgeable heating engineers. We guarantee our work and parts (if supplied by us) for one year. We only supply and fit high quality parts. We will take full responsibility if in the unlikely event that our work is of an unsatisfactory standard. We do not guarantee temporary repairs, parts supplied by the customer and drain clearances. Home Comfort Assured, your plumber Watford.